Ireland's late Nobel Prize winner transformed my ideas of what it can mean to be a poet. 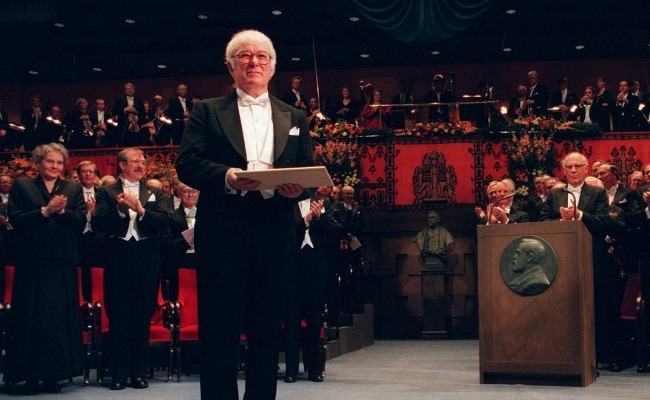 When Seamus Heaney won the Nobel Prize, in 1995, I was living in Dublin during a semester off from college, working in a crowded, narrow restaurant at the heart of the city (long days, no tips; pre-Celtic Tiger, this was a time when people brought in their own tea bags or shared one tea bag among a group). I was 19, and I wanted, in a vague, romantic way, to be a poet—an enterprise I associated with strong feelings as much as anything else. I was terribly broke, but I read whatever I could get my hands on, focusing mostly on Irish writers, from Yeats to Patrick Kavanagh to, of course, Seamus Heaney. Heaney’s “bog poems,” as they’re known (“Bogland” and “The Tollund Man” and others) had made a particular impression on me for the way that they addressed nationalistic and ethical concerns while never losing their visceral force. In them, Heaney finds a haunting way of thinking about the social through the particular, invoking the idea of a “sad freedom” while also writing about the way a dug-out bog man’s body might still be full of “his last gruel of winter seeds/caked in his stomach." So I have a vivid memory of the day the Nobel was announced. Everyone was excited, talking about the news. I was cleaning off the tables during the morning rush when I spotted a newspaper someone had left behind, with Heaney’s picture on the front page, and I squirreled it away to study on my break, with a cup of tea and a piece of soda bread. I read the articles about him slowly. As a teenager who had no idea how one actually became a poet, there was something unspeakably powerful about the reality of this news, and what it meant to many of the Irish people around me. Somehow, being there, and holding this paper in my hand, seeing how important Heaney’s poetry was to the culture I was living in, changed my sense of what it meant to be a poet. It was not just a personal avocation; it was a kind of ethical responsibility. And because I was living in Ireland, drinking its tea and Guinness and breathing its moist air, the poems no longer seemed like a performance of an exotic Irishness (as they might have to my still callow mind) but a deeply accurate description of the landscape and the people I met: a record of their attitudes, their speech, their ways of being. Poetry wasn’t inventive romance; it was a way of describing reality. It was actually a form of speech, as intimate as it was magnificent. That immediacy of voice is one of Heaney’s greatest attributes as a poet. As well-shaped and musical as his poems are, they never seem fancy or false or even baroque. They have a plainspokenness derived from his childhood in the country. A “country boy” from Northern Ireland who got a scholarship to a Catholic boarding school, Heaney left his family’s farm life behind when he was quite young, but it stayed in his soul somehow. In the '60s, he moved to Belfast, where he began to make a name for himself, as part of the so-called “Northern School” of Irish poets—among them, Derek Mahon and Michael Longley. Like some of their work, his is rooted in physical experience, in dirt and peat and cow udders and green hedges; one of the most startling images in his early poems is a dead younger brother’s “poppy bruise” glimpsed as the boy lies at the wake in a “four foot box, one for every year.” His work is also preoccupied by the difference between father and son, with the way that his urban, worldly life had a shadow rural life behind it. “By God, the old man could handle a spade./ Just like his old man./ My grandfather cut more turf in a day/ Than any other man on Toner’s bog." Heaney was also extraordinarily kind. In 2008, 13 years after my youthful time abroad, I went back to Ireland for the first time to read at a national poetry festival at Dun Laoghaire, a suburb of Dublin, at which Heaney was headliner. Dublin had changed (it was easy to find coffee, and everywhere you went you could hear Eastern European languages being spoken), and in the intervening years I had published a book of poems I was still astonished that anyone had read. There was a collective reading of younger poets and just as it got started, in came Seamus to sit and listen, which he did appreciatively. Then he gave a brilliant reading. Afterward we all hung out at the bar. There was some whispering about whether “Seamus” would come—he always did, I was told, by some of the less rattled Irish poets. We drank and talked in the warm light, telling jokes, and then sure enough in came Seamus to join us. I was too shy to speak up, but he told me he liked my poems, and asked all of us if we wanted a beer. We did, of course. I don’t remember much else except being glad to be in his presence, talking about poetry; and I do remember that I didn’t know how to tell him how much reading his poems while I lived in Dublin had meant to me. Now I wish I had. “Digging” from OPENED GROUND: SELECTED POEMS 1966-1996 by Seamus Heaney. Copyright © 1998 by Seamus Heaney. Reprinted by permission of Farrar, Straus and Giroux, LLC.